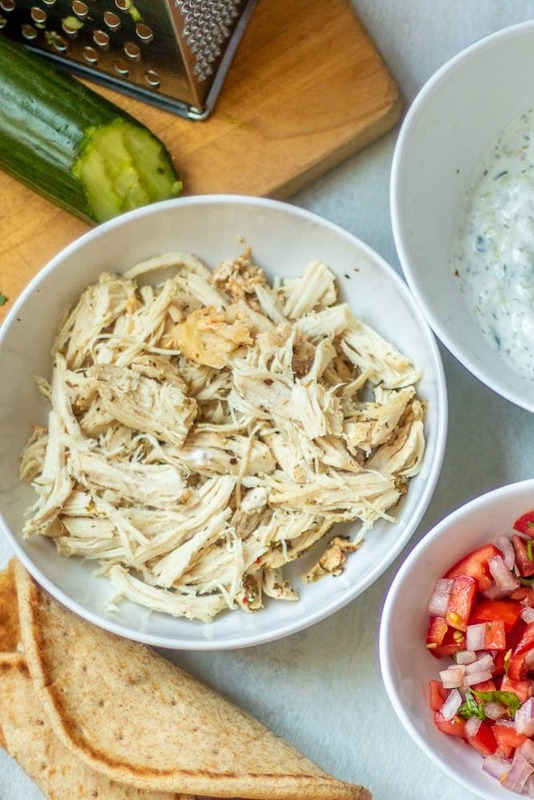 Whether you make Chicken Gyros on the grill, in the Instant Pot, or in the Slow Cooker, you will fall in love with this Easy Gyro Recipe that is served with fresh tomatoes and onions and a homemade Tzatziki Sauce. There may be controversy on how you pronounce the word Gyro, but there is no controversy on how good a simple Gyro Sandwich is. While lamb cooked on vertical rotisserie is traditional in this Greek sandwich, seasoned chicken makes a great substitute–and can be prepared without the rotisserie with great results. To create a perfect gyro, you need 4 essential things. 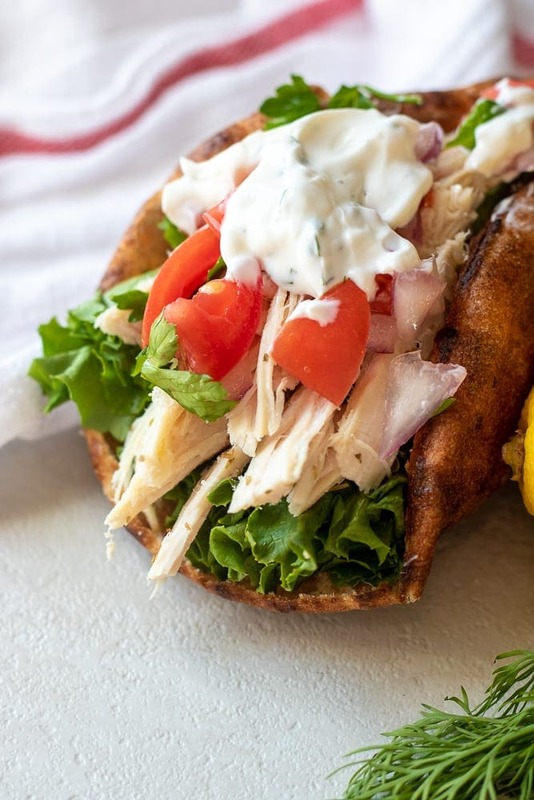 When tender, juicy chicken is piled onto a soft warm pita and then topped with creamy Tzatziki and fresh onions and tomatoes, a gyro sandwich becomes a masterpiece. Chicken Gyros are filled with contrasting temperatures and textures and of course incredibly flavor. Let chicken marinade for at least 2-4 hours. grill, slow cook, saute, oven bake or cook in pressure cooker. Assemble Chicken Gyros on pita bread. After you marinate the chicken in the Greek marinade, you can prepare this chicken in a variety of ways. In the winter I opt for slow cooking, or using my Instant Pot to achieve shredded, juicy chicken. In the summer, I love to throw the chicken on the grill for an added charred flavor in the gyro. This Greek Marinade consists of yogurt, lemon juice and dried oregano. It is a simple marinade that flavors and tenderizes the chicken for a perfect base for these gyros. For these Chicken Gyros, I like to add minced garlic for extra flavor. Feel free to omit if you are not a fan of garlic. Marinate chicken as directed for at least 2 hours. Remove chicken breasts from marinade and grill on each side until the chicken reaches 165 degrees, about 5-6 minutes per side. Remove chicken from grill and let rest for 5-10 minutes. Remove chicken from marinade and place in oven safe dish that will fit inside pressure cooker. Place the rack inside the inner pot of your pressure cooker and pour in 1 cup of water. Place the dish with the chicken on the rack and close the lid. Cook on high pressure for 7 minutes for chicken breasts. (Yes, I know I normally say 6 minutes for fresh chicken breasts, but when using Pot in Pot Method you usually need to add 1 minute to cook time. Shred chicken with two forks or hand held kitchen mixer. Remove chicken from marinade and place into slow cooker. Add in 1/2 cup chicken stock. Cook on low heat for 3-4 hours, or until chicken reaches and internal temperature of 165 degrees. Remove chicken breasts from marinade and place on oven safe broiler pan or sheet pan. Bake chicken breasts for 18-20 minutes, or until chicken breasts reach an internal temperature of 165 degrees. Remove chicken from oven and let rest for 5-10 minutes. To make a good Gyro, you MUST have the right toppings. finely chop up red onions and tomatoes and season with a splash of fresh lemon juice, salt, and chopped parsley. Warm pita bread in dry skillet or microwave for 30 seconds, until soft and pliable. Place 1/4-1/3 cup sliced or shredded chicken on center or each pita. Top with 1/4 cup diced red onions and tomatoes. Generously dollop Tzatziki Sauce over Chicken Gryo. Mix together yogurt, lemon juice, and seasonings in large bowl or freezer bag. Submerge chicken breasts into marinade. Preheat grill to medium high heat. Remove chicken breasts from marinade and grill on each side until the chicken reaches 165 degrees, about 5-6 minutes per side. Remove chicken from grill and let rest for 5-10 minutes. Slice into thin strips. Remove chicken from marinade and place in oven safe dish that will fit inside pressure cooker. Place the rack inside the inner pot of your pressure cooker and pour in 1 cup of water. Place the dish with the chicken on the rack and close the lid. Cook on high pressure for 7 minutes for chicken breasts. Let pressure release naturally. Shred chicken with two forks or hand held kitchen mixer. Remove chicken from marinade and place into slow cooker. Add in 1/2 cup chicken stock. Cook on low heat for 3-4 hours, or until chicken reaches and internal temperature of 165 degrees. Shred chicken with two forks or hand held kitchen mixer. Preheat oven to 400 degrees. Remove chicken breasts from marinade and place on oven safe broiler pan or sheet pan. Bake chicken breasts for 18-20 minutes, or until chicken breasts reach an internal temperature of 165 degrees. Remove chicken from oven and let rest for 5-10 minutes. Slice into thin strips. Mix together diced tomatoes, onions, lemon juice, and chopped parsley. Season with pinch of salt and pepper. Place 1/4-1/3 cup sliced or shredded chicken on center or each pita. Top with 1/4 cup diced red onions and tomatoes. Generously dollop Tzatziki Sauce over Chicken Gryo. It is a great idea to prepare double the chicken and freeze cooked chicken to enjoy Chicken Gryos at a later date. My family loved this recipe! Will be making again and again! oh my gosh this was so tasty!! Yay!! I love hearing that Aimee!